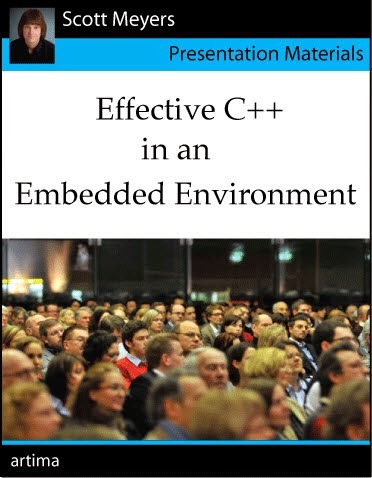 Nobody asked me about the writing of Effective Modern C++ (EMC++), but I wanted to talk about it a little, so here we go. In my now-somewhat-dated article for prospective technical book authors, I mention how much time authors invest in writing a book, with estimates ranging from 1.7 to 6 hours per finished book page. I was curious about how much time I spent writing EMC++, so I tracked it, sort of. I actually tracked the days where working on the book was my primary activity, and the result was that I spent 29 weeks from the day I started writing to the day I had a complete draft of the entire book. (The weeks were not always consecutive.) During these weeks, writing the book was essentially my full-time job. If we figure a 40-hour work week, that'd yield about 1160 hours, but although writing EMC++ was my primary activity during those weeks, it wasn't my only activity. Let's knock that number down by 20% to account for my occasionally having to spend time on other things. That yields 928 hours to produce a full draft of the book. Sending in files for publication. During that time, Item and chapter drafts were being reviewed by outside readers, but I hadn't had time to revise the manuscript to take all their comments into account. Doing that (i.e., going from a full book draft to a "final" manuscript), revising the "final" manuscript to take the copyeditor's comments into account, and marking up the manuscript for indexing took another 11 weeks, i.e., 352 hours (again assuming an 80% time investment and 40-hour weeks). That yields a total of 1280 hours. At that point, I'd marked up the manuscript for indexing by the publisher, but I hadn't reviewed the resulting index, nor had I reviewed the typeset pages or digital files for the rest of the book. That work took place in bits and pieces over the course of about 8 weeks. I didn't track my time, but I figure it took at least two full-time weeks on my part, so let's call it another 64 hours. That pushes the total "writing" time (which includes reviewing and processing comments from outside readers of pre-publication manuscripts as well as reviewing pre-publication files from the publisher) to about 1344 hours. Let's round up and call it 1350. That amount of time, viewed as a full-time 40-hour-per-week job, corresponds to 33.75 weeks, which is a little under eight full-time months. EMC++ has about 310 final printed pages that I wrote (i.e., excluding pages whose content was generated entirely by the publisher), so my productivity was roughly 4.3 hours per final printed page. My book has about 310 pages. 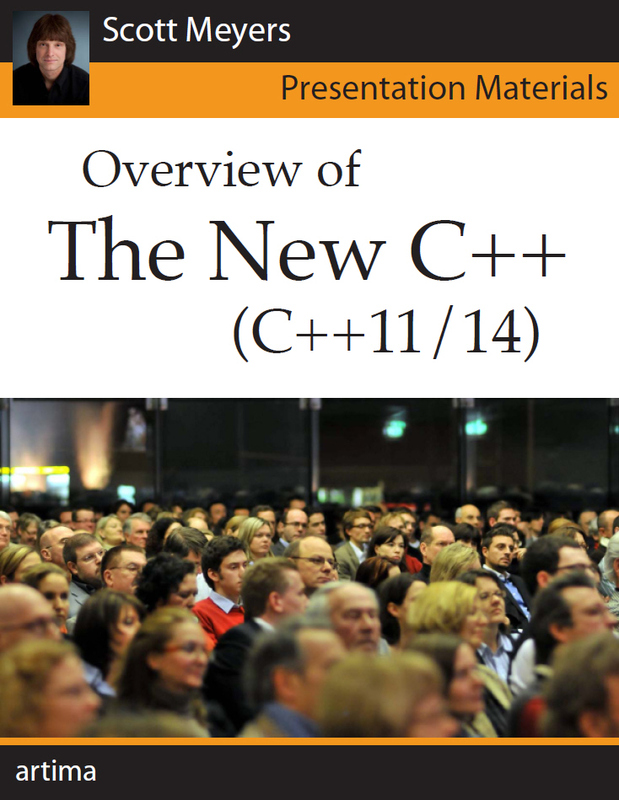 Bjarne's fourth edition of The C++ Programming Language has about 1340. Do the math and marvel at the effort such a book requires. Even if he's twice as productive as I am, that represents 2880 hours--sixteen full-time months! I'm glad I don't have his job. 2009 Started studying C++0x (the nascent C++11). 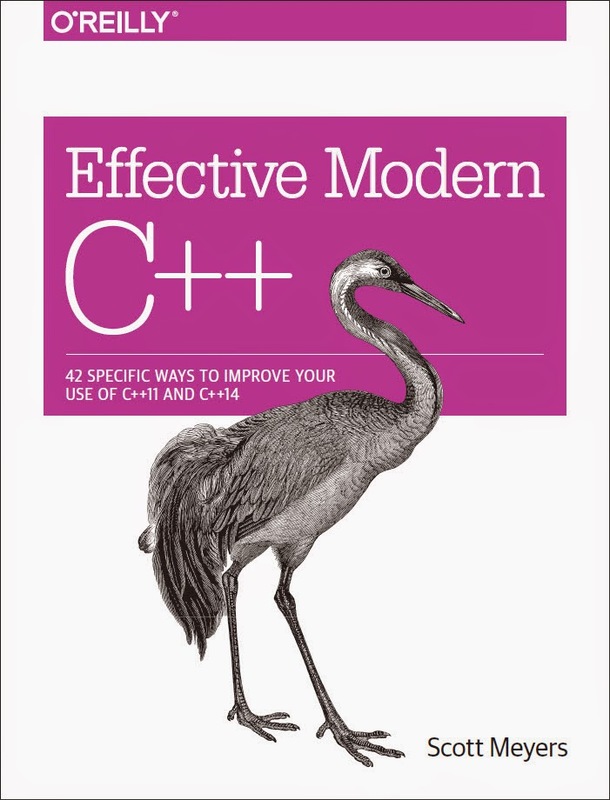 July 1, 2013 Started writing what was then known as Effective C++11/14. 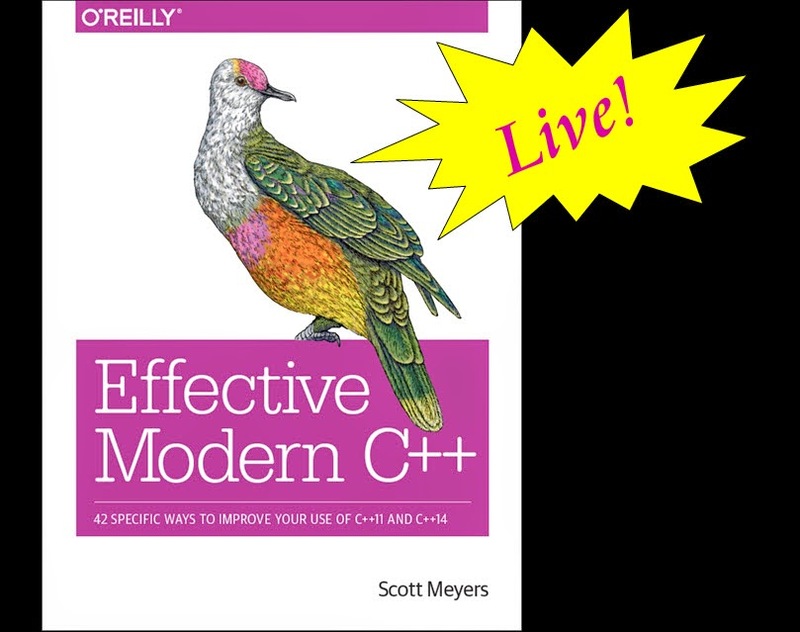 June 20, 2014 Completed full draft of Effective Modern C++. September 5, 2014 Submitted final manuscript and index information to O'Reilly. November 2, 2014 Approved print and digital versions of the book for publication. December 4, 2014 Received first printed copy of EMC++. As an aside, preparing materials for a technical talk generally takes me about 30 minutes per slide, so the one-hour talk I gave at CppCon last year probably took about 23 hours to put together. I explained that this code has the drawback that if control flows through this block such that the ThreadRAII object tr is created, but p.set_value() isn't executed (e.g., because an exception gets thrown), tr will hang in its destructor waiting to join with a thread that will never finish. For details, watch the webcast or consult pages 266-269 of the printed book (i.e., the second half of Item 39). 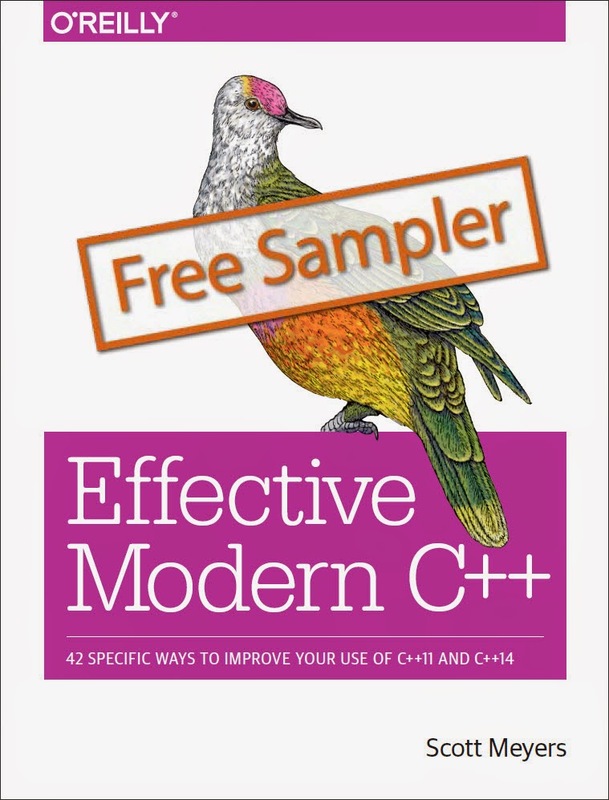 In Effective Modern C++, I conclude my discussion of this matter with "There are ways to address this problem, but I’ll leave them in the form of the hallowed exercise for the reader," and I refer to a blog post I made in December 2013 that, along with the comments it engendered, examines the issue in detail. In the webcast, I offer an explanation for why I don't show how to deal with the problem: "I don't know of a solution that's clean, simple, straightforward, [and] non-error-prone." With this approach, if set_value isn't called, p's destructor will write a std::future_error exception into the shared state that the future accesses, and that will cause the call to get in t2 to unblock. t2 will thus be able to run to completion. We won't know when t2 will complete, and we certainly can't guarantee that it will occur before the block containing tr finishes executing, but this will avoid the problem in my code whereby tr's destructor blocks waiting for a call to set_value that never occurs. An interesting subtlety of this code is the lambda's capture clause, which performs what amounts to a move capture of the future produced by p. This is in contrast to the reference capture of p present in my code. My code performs a join on t2, and t2's lifetime is less than p's, so p must exist while t2 runs. It's therefore safe for t2 to refer to p. In Michael's approach, the detach means it's possible for t2 to continue running after p has been destroyed. It's thus critical that t2 not access p, and the move capture of p's future arranges for that to be the case. I'm grateful to Tomasz Kamiński for bringing this issue to my attention, though I'll note that Yehezkel Bernat suggested the same thing (presumably on stylistic grounds) in group chat during the webcast. In order to avoid having tr hang in its destructor, p must be destroyed before tr. That means that p must be defined after tr, because objects are destroyed in the inverse order of their construction. tr must be initialized with the function its thread will execute, and that function must wait on a future that we provide. To get a future, we need a std::promise. That means that p must be defined before tr, because we need p to produce the future for initialization of tr. Bullets 2 and 5 are contradictory. std::promise<void> p;     // before p! A key element of this design is a class that bundles together a std::thread (inside the ThreadRAII object) and a std::promise. That idea was the crux of the first comment on my December 2013 blog post; it was made by Rein Halbersma. Other commenters on that post embraced the same idea, but as the thread went on, things got increasingly complicated, and by the end, I wasn't really happy with any of the solutions presented there. That's why I didn't use any of them in the book. In retrospect, I should have spent more time on this problem. I'm grateful to Michael Lindner and Tomasz Kamiński for pushing me to revisit the problem of thread suspension through void futures, ThreadRAII, and exception-safe code.